Having read Cthulhu Williams #0 three times now, I can tell you without hesitation that writer and creator Tim Stiles has a hit on his hands. Stiles has written a story simple in structure but intricate due to its use of demons and monsters. What’s exceptional about Stiles’ skill as a writer is that nothing is lost by not knowing the entire story of the case. Williams, a cowboy meets private investigator, is given a tip about a mysterious kidnapper, and that’s all the backstory necessary. 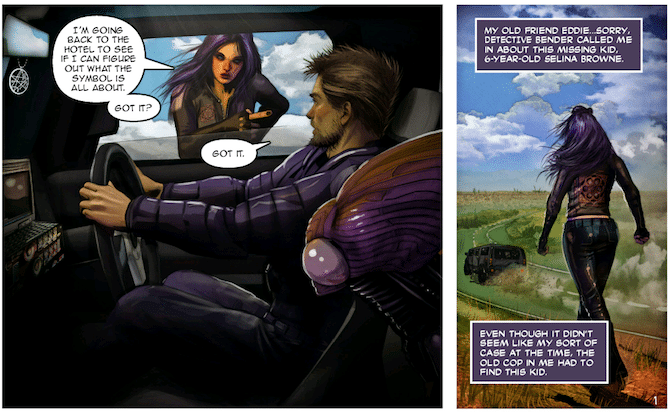 Readers are also introduced to the other two main characters in the story in the opening panels. Trixx is the “emotional backbone” of the group according to Stiles, and this is apparent in her dialogue. She’s also intelligent and a fighter, as evidenced by the later action of the issue. Mr. Grey, on the other hand, is nearly played as comic relief. We never understand what he says because he speaks in an alien language, but Williams can understand him and that, too, is all that’s necessary. Whether this was intentional or not, Stiles has given these two characters a relationship that mimics another famous human and alien duo, Han Solo and Chewbacca. I thought it was particularly inspired to allow the reader to create the dialogue for Mr. Grey as opposed to forcing a translation. This made him a curious character you want to know more about. That was also my reaction when Mr. Grey telekinetically assembled an alien gun. This was a clever way to show the superior powers of the character and showcase the artistic talent of Stiles’ illustrator, Mortimer Glum. Glum has clearly taken this project seriously and done his best to create a masterpiece of art opposite Stiles’ engaging storytelling devices. Every panel of Glum’s art is beautiful and masterfully painted. I was especially impressed with his painted backgrounds that feature an ever-changing sky as the day passes into night. It creates a clear visual aesthetic the characters and story both mesh with. Blues and whites match the witty banter of the character trio, while the darker purples and oranges work well with the tone set by the violence perpetrated before. Speaking of the violence, Glum excels as an artist in dark, bloody moments as well. The blood splatters the page like a Jackson Pollock painting and tells a story visually even without dialogue from Stiles’ characters. My only problem with this first issue is a reference to The Wolf of Wall Street. It is certainly a small complaint, but the reference pulled me out of the story for a moment when I didn’t want to be pulled out. I understand the reference provides readers a cultural connection and tells them that all of these supernatural things aren’t happening in a fictional world, that they’re happening right down the street, but I’d prefer to see Stiles focus on the rich mythology he’s created and move away from pop-culture references. Like I said, this is a minimal critique, but if he uses them seldom as he has here then I would be more willing to forgive the choice. This is one of the best first issues I’ve ever read, and I honestly can’t wait to see where this story goes. I’m not usually a huge horror fan or dark science-fiction lover, but Stiles got me with this issue hook, line, and sinker. I encourage you to seek out this first issue and follow as this writer and his artist continue to grow.